The wearable muslin is almost done! 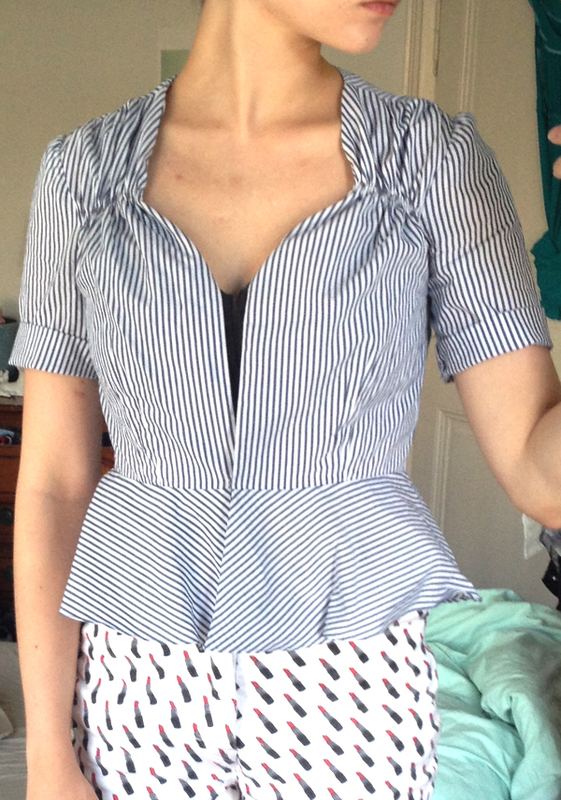 I hastily attached a hook and eye closure at the waist yesterday so I could wear it over my bustier, but I will finish it properly, I promise, buttons and all! Especially because I can't check the fit exactly if it isn't buttoned up. Gaaahh, I'm typing this as I'm getting my roots re-done at the hairdresser. Oh how it burns! At least they got me a beer to dull the pain. Anyway, onward! sleeve ease: these sleeves are really tight! It's ok once the blouse is on, but putting it on and taking it off is a hassle (you know when you have to fold your arms all the way back and make weird wriggling movements? not classy). bodice back ease: I think that's another factor contributing to the hassle of putting on / taking off, and as I'm shirring the back (still need to to that on the muslin! ), I think I can get away with some more ease at the back. bodice front ease: it's nothing extreme, but I might just add like 2 centimeters to the front (probably at center front and the side seams). 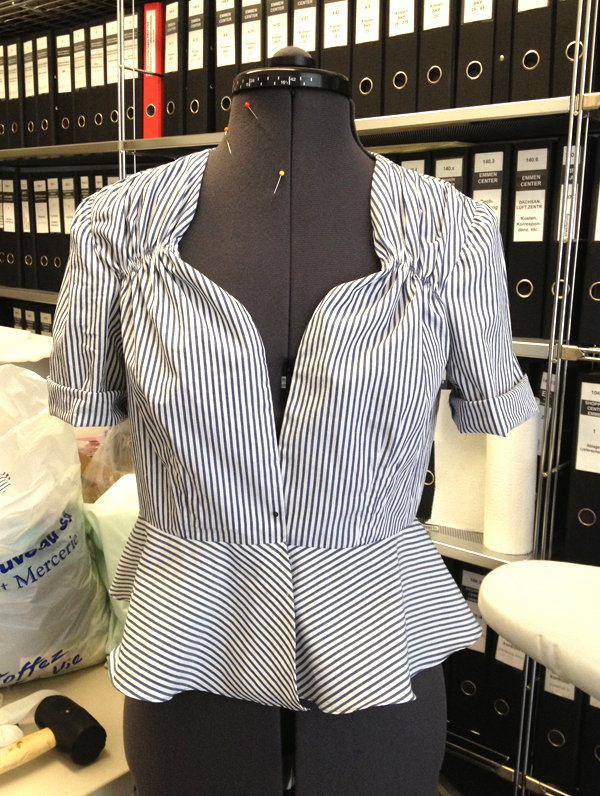 But I'm not sure yet, maybe fixing the back bodice will be enough. neckline detail: it's just a small detail, but you can see the shirring line droops slightly towards the armhole, I'm not sure I like that. I wonder if on the actual dress in the film, the neckline detail (gathering) is made by smocking the fabric, because on my muslin the folds look a lot "bigger" somehow. It might also just be the stiffness of the fabric, the fabric looks very drapey in the movie. What do you think? I don't know anything about smocking really, I've just seen close-ups of it and it looks really beautiful! Hmm, I just looked at the dress from the film again, and I think I might just have to add more rows of shirring (5 instead of 3), and move the line of shirring up further. But for this blouse, I quite like it this way. The peplum is a very short 3/4 circle skirt, pretty straightforward, hemmed with a narrow hem foot (another technique I first tried on the emerald slit dress!). The sleeves are actually unfinished, I just rolled them up so I could wear the blouse (sort of), but I like the rolled look! I took shortcuts on the seam finishes with this wearable muslin, I just sewed a straight stitch close to the edge of the seam allowances, but I think it'll work, the cotton fabric doesn't seem to unravel that easily. The Reaping Blouse - Finished!